Infections of the orbit are uncommon, but they are potentially devastating infections that can quickly result in blindness, meningitis, or death. The emergency physician must make a rapid and accurate diagnosis and then quickly initiate therapy because visual loss is associated directly with the length of time to definitive treatment. The orbit is a pyramid-shaped bony space in the anterior skull that contains the globe, the blood vessels, and the intraorbital muscles and nerves. The space is bordered on its superior, medial, and inferior sides by the facial sinuses (frontal, ethmoid and sphenoid/maxillary, respectively). Note, the frontal sinuses normally develop at the age of 8 years and are not fully developed until puberty. 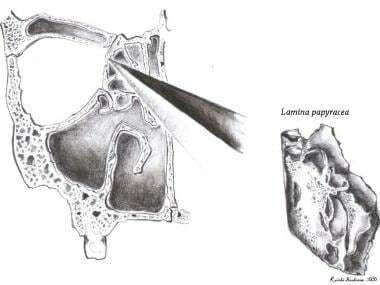 The bony septa separating the orbit from the sinuses are thin and fenestrated, particularly in the medial orbital wall, where the lateral ethmoid bone, which also makes up the lateral orbital wall, is particularly thin and porous and is named the lamina papyracea. An understanding of this anatomical relationship (see the image below) is key to appreciating the pathophysiology of orbital infections. The anterior border of the orbit is marked by the orbital septum, a fibrous band from the external bony orbit to both eyelids (specifically from the periosteum of the orbital rim to the levator aponeurosis in the upper eyelid and to the inferior border of the tarsal plate in the lower eyelid), which effectively separates the preseptal space from the orbital space. This is actually contiguous with the periosteum that is reflected into the upper and lower lids. The posterior wall of the orbit contains the optic canal and the superior and inferior orbital fissures. 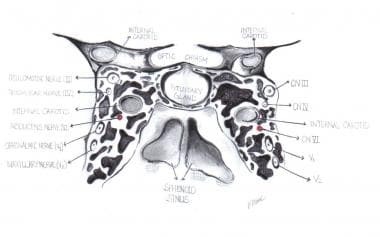 The superior orbital fissure connects directly to the cavernous sinus and the intracranial space. The facial veins drain directly into the valveless superior and inferior ophthalmic veins. These, in turn, drain via many anastomoses into the cavernous sinus. The posterior wall is the source of the blood and nerve supply to the orbit. The optic nerve (cranial nerve [CN] II) enters the orbit with the ophthalmic artery through the optic canal. CNs III, IV, and VI; the ophthalmic branch of the trigeminal nerve (CN V1); and the superior ophthalmic vein enter the cavernous sinus after exiting the orbit through the superior orbital fissure. The superior ophthalmic vein provides the main venous drainage for the contents of the orbit. The smaller inferior ophthalmic vein exits the orbit through the inferior orbital fissure with the maxillary branch of the trigeminal nerve (CN V2) and connects with the temporal fossa. Orbital infections develop via direct inoculation, extension from adjacent structures, and hematogenous spread. Sixty percent of these infections develop from the direct spread of sinusitis, with the ethmoid sinus being the most commonly implicated owing to its thin and porous walls (lamina papyracea). Infections also can spread from the preseptal space, particularly from preseptal (or periorbital) cellulitis in children, as well as from the pharynx, middle ear, facial skin, nose, lacrimal gland (dacryocystitis), or dentition. The ease and rapidity of such infectious spread relates to the facial venous system, which has a great number of anastomoses and is entirely valveless. Infectious material can be inoculated directly into the orbital soft tissue secondary to trauma, surgery, or orbital foreign bodies. More rarely, orbital infections develop from hematogenous seeding secondary to sepsis or bacterial endocarditis. Orbital infections are classified by a 5-tier system, as described by Smith and Spencer and modified by Chandler et al. This classification system does not necessarily imply an order of disease progression; however, it helps explain the physical signs and symptoms of the various infections and helps organize treatment plans. Preseptal (or periorbital) cellulitis, which is an inflammatory edema of the eyelids and periorbital skin with no involvement of the orbit, comprises the first group. Orbital signs (eg, chemosis, proptosis, visual loss) are not present in this infection. Preseptal cellulitis (like many soft tissue infections of the face) may extend posteriorly, owing to the valveless communication of the facial and ophthalmic veins to the cavernous sinus, to produce one of the intraorbital infections (groups II-V). Orbital cellulitis may or may not progress to a significant subperiosteal abscess, orbital abscess, or cavernous sinus thrombosis. Subperiosteal abscesses are collections of purulent material between the orbital bony wall and periosteum. This entity may develop in 7-9% of patients initially with orbital cellulitis or from spread of an adjacent infection, as occurs when ethmoid sinusitis spreads to the medial orbital subperiosteal space. This diagnosis is confirmed by CT scan, but it can be suspected based on physical examination. In addition to signs of orbital involvement (eg, chemosis, visual loss), limitations of ocular motility and (ophthalmoplegia) directional proptosis may be present from the intraorbital mass effect and entrapment of the extraocular muscles. Orbital abscesses are collections of pus within the orbital soft tissue. Diagnosis is confirmed by CT scan, but the physical signs of severe exophthalmos and chemosis, with complete ophthalmoplegia, as well as venous engorgement or papilledema on funduscopic examination, are suggestive. Orbital infections. Orbital abscess with significant proptosis. These infections usually are secondary to orbital cellulitis and sometimes can be differentiated from orbital cellulitis by the occurrence of the orbital apex syndrome. This syndrome is a collection of signs and symptoms consistent with organized infection in the posterior orbit (specifically, compression of the superior orbital fissure), and it is highly suggestive of group IV or V disease. Signs include unilateral ptosis, proptosis, visual loss, internal and external ophthalmoplegia (ie, palsy of the pupillary and extraocular muscles), and CN V1 (forehead) anesthesia. Orbital abscess may or may not progress to cavernous sinus thrombosis. The cavernous sinus, a circular venous structure surrounding the pituitary gland, drains blood from both orbits. Although the incidence is low, CST is a serious complication of untreated orbital infections and infectious thrombosis most commonly spread from the orbit via communicating orbital veins traveling through the superior orbital fissure into the cavernous sinus. Infectious CST is characterized by headache, high fever, periorbital edema, proptosis, chemosis, and paralysis of eye movements. Once again, this diagnosis is confirmed by CT scan or MRI; however, the physical sign of bilateral posterior orbital disease is highly suggestive. Bilateral involvement occurs because the right and left ophthalmic veins drain into the same circular contiguous sinus. Since the cavernous sinus is connected through the midline, thrombosis of one side may thrombose the other side. Complete internal and external ophthalmoplegia often is produced when thrombosis of the sinus causes palsy of CNs III, IV, V1, and the sympathetic fibers as they travel through prior to entry into the orbit. CN VI is most susceptible owing to its long course and narrow diameter. In addition, this explains the abducent’s relatively high susceptibility to palsy in instances of elevated ICP and to intracavernous pathology because of its intraluminal course. Note the image below. Cavernous sinus and its cranial nerves. To fully understand CST, one must be reminded of its unique vascular connections. This dural sinus, like all dural sinuses (eg, sagittal, transverse), has no valves. Because of this, blood flows in either direction because of pressure gradients in the vascular system. Additionally, the CST receives many connections from potentially vulnerable, centrally located facial structures. Septic thrombosis can develop from infected tributary sites such as the face, nose, soft palate, tonsils, teeth, and ears. Note that the wide use of antibiotic therapy for infections involving the stated structures has allowed an increasing emergence of sphenoid sinusitis–induced CST. The distinction between infectious thrombosis and orbital infection alone is important because the treatment of cavernous sinus thrombosis may involve the addition of anticoagulation therapy to the antibiotic therapy. 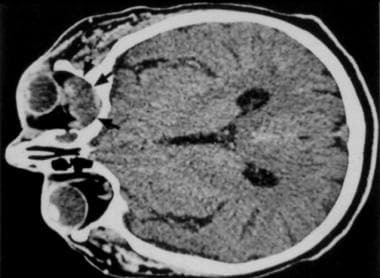 The use of anticoagulation therapy in sinus thrombosis remains controversial because of concerns with safety, as it may precipitate a hemorrhagic infarct. [7, 8] Intracranial infection or cavernous sinus thrombosis can result from any stage of orbital infections. Males are affected slightly more often than females. Orbital infections are more common in persons younger than 19 years. In fact, bacteremic periorbital cellulitis is most often seen in infants younger than 18 months of age. Orbital infections are more severe in adults. Mathew A, Craig E, Al-Mahmoud R, Batty R, Raghavan A, Mordekar S, et al. Paediatric Post-septal and Pre-septal Cellulitis: 10-year Experience at a Tertiary-level Children's Hospital. Br J Radiol. 2013 Nov 28. [Medline]. Nemet AY, Ferencz JR, Segal O, Meshi A. Orbital cellulitis following silicone-sponge scleral buckles. Clin Ophthalmol. 2013. 7:2147-52. [Medline]. [Full Text]. Hightower S, Chin EJ, Heiner JD. Detection of increased intracranial pressure by ultrasound. J Spec Oper Med. 2012. 12(3):19-22. [Medline]. Wayman D, Carmody KA. Optic Neuritis Diagnosed by Bedside Emergency Physician-Performed Ultrasound: A Case Report. J Emerg Med. 2014 Mar 15. [Medline]. Ahmad R, Salman R, Islam S, Rehman A. Cavernous Sinus Thrombosis As A Complication Of Sphenoid Sinusitis: A Case Report And Review Of Literature. Internet J Otorhinolaryngol. 12(1):[Full Text]. Ben Abdallah Chabchoub R, Kmiha S, Turki F, Trabelsi L, Maalej B, Ben Salah M, et al. [Septic cavernous sinus thrombosis following ethmoiditis: A case report.]. Arch Pediatr. 2013 Nov 26. [Medline]. Botting AM, McIntosh D, Mahadevan M. Paediatric pre- and post-septal peri-orbital infections are different diseases. A retrospective review of 262 cases. Int J Pediatr Otorhinolaryngol. 2008 Mar. 72(3):377-83. [Medline]. Ambati BK, Ambati J, Azar N. Periorbital and orbital cellulitis before and after the advent of Haemophilus influenzae type B vaccination. Ophthalmology. 2000 Aug. 107(8):1450-3. [Medline]. DeMuri GP, Wald ER. Clinical practice. Acute bacterial sinusitis in children. N Engl J Med. 2012 Sep 20. 367(12):1128-34. [Medline]. Seltz LB, Smith J, Durairaj VD, Enzenauer R, Todd J. Microbiology and antibiotic management of orbital cellulitis. Pediatrics. 2011 Mar. 127(3):e566-72. [Medline]. Freidlin J, Acharya N, Lietman TM, Cevallos V, Whitcher JP, Margolis TP. Spectrum of eye disease caused by methicillin-resistant Staphylococcus aureus. Am J Ophthalmol. 2007 Aug. 144(2):313-5. [Medline]. McKinley SH, Yen MT, Miller AM, Yen KG. Microbiology of pediatric orbital cellulitis. Am J Ophthalmol. 2007 Oct. 144(4):497-501. [Medline]. Blomquist PH. Methicillin-resistant Staphylococcus aureus infections of the eye and orbit (an American Ophthalmological Society thesis). Trans Am Ophthalmol Soc. 2006. 104:322-45. [Medline]. [Full Text]. Mills DM, Tsai S, Meyer DR, Belden C. Pediatric ophthalmic computed tomographic scanning and associated cancer risk. Am J Ophthalmol. 2006 Dec. 142(6):1046-53. [Medline]. Younis RT, Anand VK, Davidson B. The role of computed tomography and magnetic resonance imaging in patients with sinusitis with complications. Laryngoscope. 2002 Feb. 112(2):224-9. [Medline]. Parmar H, Gandhi D, Mukherji, SK, Trobe JD. Restricted Diffusion in the Superior Ophthalmic Vein and Cavernous Sinus in a Case of Cavernous Sinus Thrombosis. J Neuro-Ophthalmol. 2009. 29;1:16-20. [Medline]. Sepahdari AR, Aakalu VK, Kapur R, Michals EA, Saran N, French A, et al. MRI of orbital cellulitis and orbital abscess: the role of diffusion-weighted imaging. AJR Am J Roentgenol. 2009 Sep. 193(3):W244-50. [Medline]. Hennemann S, Crawford P, Nguyen L, Smith PC. Clinical inquiries. What is the best initial treatment for orbital cellulitis in children?. J Fam Pract. 2007 Aug. 56(8):662-4. [Medline]. Aygün D, Doğan C, Hepokur M, Arslan OŞ, Çokuğraş H, Camcıoglu Y. Evaluation of patients with orbital infections. Turk Pediatri Ars. 2017 Dec. 52 (4):221-225. [Medline]. Farnath D. Ocular infections. Infectious Disease in Emergency Medicine. 2nd ed. 1998. 843-58. Ghezzi K, Renner GS. Ophthalmologic disorders. Emergency Medicine. Concepts and Clinical Practice. 1992. 2427-59. Gordon LK. Diagnostic dilemmas in orbital inflammatory disease. Ocul Immunol Inflamm. 2003 Mar. 11(1):3-15. [Medline]. Hendrickson RG, Olshaker J, Duckett O. Rhinocerebral mucormycosis: a case of a rare, but deadly disease. J Emerg Med. 1999 Jul-Aug. 17(4):641-5. [Medline]. Kraus DJ, Bullock JD. Orbital infections. Pepose JS, Holland G, Wilheimus K, eds. Ocular Infection and Immunity. Mosby-Year Book; 1996. 1321-40. Mahalingam-Dhingra A, Lander L, Preciado DA, Taylormoore J, Shah RK. Orbital and periorbital infections: a national perspective. Arch Otolaryngol Head Neck Surg. 2011 Aug. 137(8):769-73. [Medline]. Prentiss KA, Dorfman DH. Pediatric ophthalmology in the emergency department. Emerg Med Clin North Am. 2008 Feb. 26(1):181-98, vii. [Medline]. Rumelt S, Rubin PA. Potential sources for orbital cellulitis. Int Ophthalmol Clin. 1996 Summer. 36(3):207-21. [Medline]. Wald ER. Periorbital and orbital infections. Infect Dis Clin North Am. 2007 Jun. 21(2):393-408, vi. [Medline]. Westfall CT, Shore JW, Baker AS. Orbital infections. Infectious Diseases. 2nd ed. 1373-7. Yohai RA, Bullock JD, Aziz AA, Markert RJ. Survival factors in rhino-orbital-cerebral mucormycosis. Surv Ophthalmol. 1994 Jul-Aug. 39(1):3-22. [Medline]. Danishyar A, Sergent SR. Orbital Cellulitis. 2018 Jan. [Medline]. [Full Text]. Atfeh MS, Khalil HS. Orbital infections: five-year case series, literature review and guideline development. J Laryngol Otol. 2015 Jul. 129 (7):670-6. [Medline]. Atfeh MS, Singh K, Khalil HS. Orbital infections: a complete cycle 7-year audit and a management guideline. Eur Arch Otorhinolaryngol. 2018 Aug. 275 (8):2079-2088. [Medline]. Complications of orbital infections. Brain abscess in a young man secondary to an orbital infection from Mucor species. Orbital infections. Subperiosteal abscess with contiguous sinusitis.